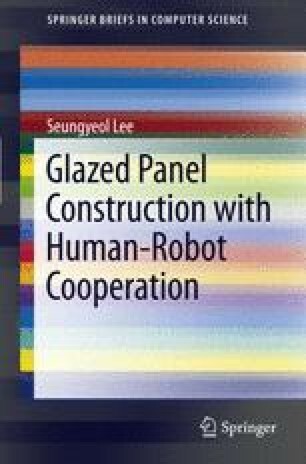 A discussion follows that describes the conceptual design of a human–robot cooperative system, which is proposed to construct glazed ceiling panels. First, considering the environment where the system is used, the required specification about the target building that is to be heavy glazed ceiling panels should be constructed. Then, the existing construction equipment and construction process for installing heavy glazed ceiling panels are analyzed. According to analysis of the target work and building, the functional requirements for implementing a glazed ceiling panel construction robot are deduced. Last, a conceptual design was produced for the proposed robot.